Classically Liberal: Welcome to the world's largest prison. Welcome to the world's largest prison. The fear-mongering of Bush, combined with the hysterical cries of the "secure the border" crowd led to new restrictions. Of course, contrary to what the hysterics says, these restrictions actually restrict Americans not terrorists or would-be gardeners and day laborers. The war on terror was a fraud from the start, it was always a war on Americans. Every measure that was passed was used, first and foremost, against Americans not against potential threats to the country. All the new spying on bank accounts isn't being used to crack down on drug cartels or international terrorists but on Americans who have funds overseas, where the greedy hands of politicians have a harder time grabbing them. To "secure our borders" the government also imposed new rules on how Americans are allowed to travel. Of course, it wasn't Americans who flew the planes on 9/11 but Muslim terrorists, all of whom had official permission to enter the U.S. To protect you from the people they let in they restrict your movement. Travel from the United States hit a peak in 2002, when about 43 million Americans crossed the border, but since then, it has eroded. One reason for the decline in recent years, said Randy Williams, president of the Tourism Industry Association of Canada, was the Western Hemisphere Travel Initiative. Two years ago, passports became mandatory for cross-border air travel, and the original plan would have required passports for land crossings as of Jan. 1, 2008. While that was delayed, confusion over the need for travel documents kept some people home, Mr. Williams said. “Only about 30 per cent of Americans have a passport, so that limits the number we can attract into Canada,” he said. Any economist will tell you that when you drive up the cost of something the demand goes down. Cost doesn't just mean how much money you pay. It also means how much hassle you have to go through to secure something, and what you have to give up in order to obtain it. 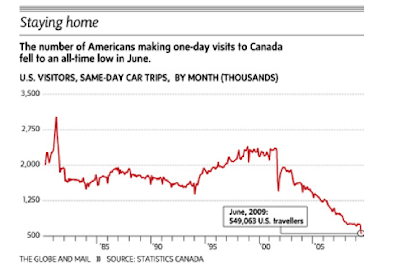 Forcing Americans, who are visiting Canada for a shopping trip, to carry as passport meant that the number of visitors dropped. Passports aren't free, there is a great deal of hassle, more than ever actually, in order to get government permission to travel. That is what a passport is, it is government permission for you to travel. Something that was once consider a right of all free people is now considered a privilege which governments can dole out, and withhold, at will. The world is a poorer place because of the morons in Homeland Security. They have trapped millions of Americans within the United States and they have discourage many millions more from visiting the U.S. Airlines are now avoiding connecting flights in the U.S. because the travel Gestapo mistreats and abuses visitors to our country. So, these measures are now keeping Americans from traveling abroad and keeping foreign visitors from coming here. Hundreds of millions of dollars of profits, both here and abroad, have been destroyed by this heavy-handed government intrusion. Government is the great wealth destroyer. My recommendation: If you don't have a U.S. passport I urge you to get one. It will only become more and more difficult to get one. You are not a free person if you are not free to walk out of your own country. When you are restricted to a specific geographical area, by armed men, and only allowed to travel with special permission slips, you are a prisoner. It may be a very large prison but it is still a prison. Second, I also recommend that you try your best to send assets overseas, as a precaution. Be warned though, since the Bush regime was in power it has become very difficult for you to do this. Many overseas banks will no longer touch American clients due to the way our government threatens foreign banks that allow Americans to open accounts. 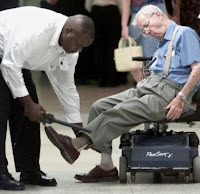 Of course, the American travel gestapo has been harassing everyone. Individuals who have connecting flights in the international section were forced to exit through customs and passport control merely so Big Brother could accumulate data on each person, even though who really aren't intending to visit the US. Individuals who only wanted to catch a flight from Canada to Mexico, with a brief US stopover, had to go through customs. If the U.S., for any reason, decided the person was unwelcome (and billions of people fit that category these days) they were not allowed to finish their flight to Mexico, but forced onto a plane to return to Canada. Anyone arriving into the United States or one of its territories (like Puerto Rico) and not covered by the Visa Waiver Program requires at least a C-1 transit visa to transit the airport. This can be expensive (US$131 minimum) and time-consuming to obtain, and you can be denied the visa: the requirements are the same as the full B-2 tourist visa. If you arrive without this visa, even for a fuel stop or transit, and aren't eligible for a waiver, you will be sent home and recorded as having been denied entry to the US. 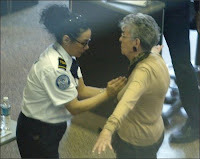 The United States does not allow sterile transit, which means that even if you have an immediate connecting flight, you have to pass through Customs and Immigration. This is time-consuming and tedious (4 hours or more is recommended to be safe), and all travellers transiting in the USA using either a transit visa or the Visa Waiver Program will be photographed and fingerprinted. You have previously been denied entry to the US or overstayed in the US, and have been advised that entry may be refused in future. Transit entry is as likely to be refused as any other entry, it will almost certainly be easier to avoid risking it. Discover America Partnership is a collection of businesses that rely on tourism. They have been complaining that government mistreatment of tourists has become so pervasive that American business is suffering. The U.S. government is scaring away customers. Geoffrey Freedman, of the group, says: "International travelers will tell you that they find that they are treated like criminals, that they are barked at by US officials. They simply feel unwelcome and that is leading them to choose other countries." The group estimates that these actions by Homeland Security thugs has cost around 200,000 jobs in the United States. A survey of international travelers found that more of them listed the U.S. as the most unpleasant place to visit when it comes to bureaucratic abuse. Freeman noted that a survey showed that foreign visitors have "more fear our immigration officials than of terrorism or crime." (Alas, Mr. Freeman seems to think those are three distinct categories, as the US government proves, they often overlap.) All this means a dramatic drop in tourism. So now the morons in the U.S. Congress have decided to fix the problem. Congress, which voted in the proposals that are scaring people away, wants to finance a program which will encourage visitors. Please note that none of the Congressvermin are suggesting changing the way we treat tourists. Instead they want to create yet another government program for the purpose of encouraging travel. Of course, such programs cost money. So the idiots in DC are wanting to pass a new tax on foreign visitors. They want to charge tourists who do come to the US an extra $10 on each trip in order to encourage more tourism. John Burton, the European Commission's Ambassador responded: "Only in Alice in Wonderland could a penalty be seen as promoting the activity on which it is imposed." Associated Press reports: "Sponsors have been promoting the law as cost-free to the U.S. taxpayer." Even that is not true. US travel thugs have cost the economy hundreds of thousands of jobs. Raising the cost for people to visit the US will only reduce the number of visitors even further. Americans will pay for the stupid proposal in several ways. More jobs will be destroyed and the tourism industry will suffer further declines. Hotels, theme parks, even National Parks will see less business and lower profits. And the EU says that if the U.S. imposes a new $10 fee on Europeans, even those who aren't require a have a visa to visit, then the EU will consider retaliation by imposing a similar tax on Americans who travel. Personally $10 to get OUT of the Homeland Security States of America might be a bargain. But who wants to pay extra to visit a prison? posted by blog owner at 9/05/2009 11:13:00 PM DiggIt! Reddit Del.icio.us Slashdot It! A few thoughts on the idea of intelligent design. Calling all porkers, your trough is ready.